Cocktail Hacker » Blog Archive » Muddle or Shake? 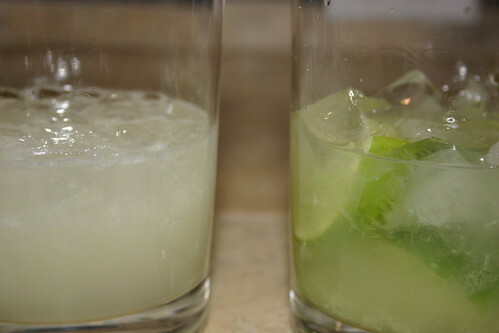 The question has plagued mankind since the development of the Caipirinha. Should one muddle the cocktail or shake? It’s the kind of question fights have been started over. Well, I couldn’t let this dilemma go unsolved any longer. So I mixed up a Caipirinha show down for the benefit of all of us. The verdict is a bit of a hard one. Both of these varients have their pluses and minuses. Certainly both are very tasty and I definitely wouldn’t turn either down. Okay, those last two cons for the muddled recipe are both a stretch. You can use damn near anything blunt as a muddler and I’d certainly hope you were buying fresh limes for this drink anyway. So, the final verdict? Make the muddled version unless you’re either making them by the pitcher full or mixing tons and tons of them for a party. Still worried that you can’t make this drink due to a lack of muddler? Fear not. The good folks at Leblon Cachaça will happily send you a muddler for only the cost of shipping ($2.00). I used mine to make the drink you see pictured above. You can pick yours up right here. Muddled version, for sure! Although shaken works if you’re fixing them up for everyone at the party. Thanks for the great post. I muddle a half-lime (quartered), 2 tsp sugar, add the cachaca, then shake with ice, and pour the whole shebang into a rocks glass. Best of both worlds – plus it helps crack the ice. Interesting method Maks. I’ll have to give that a go next time I mix one up.